disclosure of Personal Information if anyone decided to use this Service. personally identifiable information, including but not limited to a username and email address. In the use of this SERVICE you may also provide other personally identifiable information such as your location, pictures, and links to social media on a voluntary basis. Certain third party services may collect information used to identify you, such as Google Analytics: https://policies.google.com/privacy?hl=en&gl=ZZ. of your use of the Service, and other statistics. Cookies are files with small amount of data that is commonly used an anonymous unique identifier. on this page. These changes are effective immediately, after they are posted on this page. You've booked your tickets to the number one racing destination in America, so when the lights go out get your race weekend off the line with a bang! 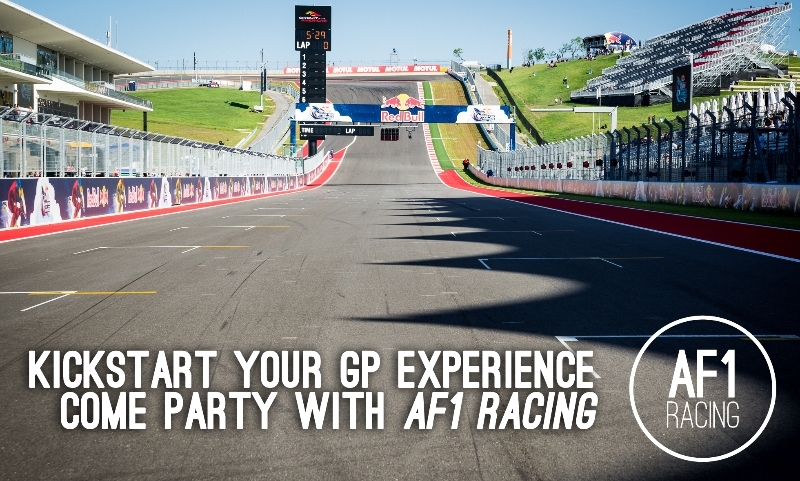 AF1 Racing invites you to the party of the race weekend at our Downtown Austin Location. We'll be kicking off our GP weekend in style by showing our appreciation of our great customers, collaborators, and friends. Join us for hors d'oeurvres, cocktails provided by Deep Eddy Vodka, music by DJ Dan Gentile (Flying Turns), door prizes*, & giveaways from some of our closest vendors so arrive early. What more can we say? How about sweet motorcycles, beautiful AF1 Racing girls, Downtown Austin, and your great friends at AF1 Racing. All of this during a fantastic weekend centered around the excitement of Moto GP at Circuit of the Americas! *Door prizes are based on first-come first-serve basis. Items are sponsors are subject to change. While RSVP is not required, it is preferred. Event details are subject to change without notice. Forum Runner is a native application for your smart phone that allows fast access to thousands of forums. There are two versions: Free Read-Only and $1.99 Full Access. $14,999 USD, Black or Yellow to choose from. Fresh out of the crate.